Martin Delambre (George Baker) meets a young woman named Patricia (Carole Gray), soon they fall in love and get married. Martin is unaware that Patricia is a recent escapee from an insane asylum, and Patricia is unaware that Martin, his father, Henri (Brian Donlevy) and brother, Albert (Michael Graham) are experimenting with telporters to grotesque effect on the subjects. It also does not help that Martin has inherited a shortened lifespan from fly genes that were passed down from the original Fly, Albert Delambre. 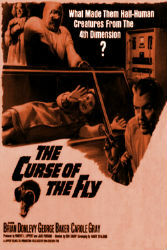 Curse of the Fly is an atypical sequel. The creators must have realized early on that there are only so many times you can plausibly put a man and a fly in a teleporter before it starts getting silly. Instead of a fly-man, this film attempts recreate the inevitable doom that pervaded the original The Fly (1958). The Delambre descendants tirelessly try and cure their disease, even at the cost of the lives of others. It’s a tragedy that rings much truer to the original rather than the silliness of Return of the Fly (1959). There is some muddled continuity which seems to conflate the events of the The Fly and Return of the Fly, introduce an as of yet unseen Delambre family member, and seems to set Curse of the Fly sometime in the 1970’s. This continuity fluff doesn’t impact the narrative greatly, but when the thrust of the story is about a curse being passed down through a family line, you would think you’d at least want to get an established family history correct. The biggest fault of Curse of the Fly is in its leaden pacing and lack of action. It is a film that slowly builds to a tragic climax but shows very little energy in getting there. Part of the problem is that the viewer is totally knowledgeable about the central mystery and we have to wait eighty minutes for our protagonist to catch up. This could work narratively, as several Hitchcock films will show, but Patricia is rarely in real danger, and the Delambre family has acted so immorally that it makes it difficult to have much concern for them. The make-up and special effects for victims of the teleportation accidents is actually quite disturbing. The strange ghoulish appearance of the survivors and the twitching remains of those who don’t make it are the highlight of what is a pretty low key film. It’s too bad that those moments are so rare and fleeting. The movie resists being a monster on the rampage story at all costs, but I think even just a little more visceral horror could have brought some much needed energy to the story. Curse of the Fly is by no means a bad film. It is a little dull, but it can can deliver some true tragedy and horror when it counts. In that respect it is a noble successor to The Fly.